As I mentioned on Friday, Betsy and I packed up all of our stuff this weekend for our move which means that I’m without a kitchen for the next two or three weeks. This is mildly devastating to me as you might imagine, but I did hang on to a few pots, pans, bowls, and knives so I can at least cook some stuff over the next few weeks. So the things you’ll see on Macheesmo at least until the end of the month will almost definitely be quick and require just the most basic equipment. I have no doubt that I can make some really awesome dishes with just the basics. And that brings me to this dish. While it’s not exactly a one pot dish, it’s pretty close. It’s actually a pot, a baking dish, and a bowl dish. But for as simple as it is to make, the flavors are really awesome and delicious. And it uses one of my favorite pastas: orzo! 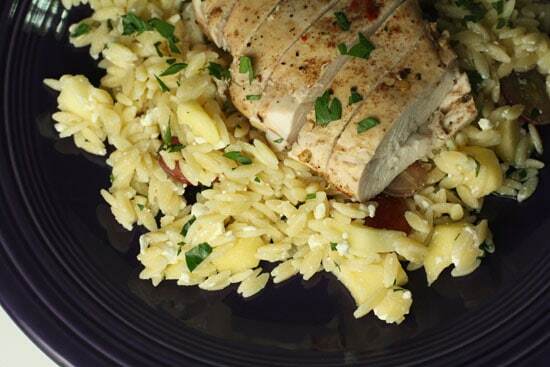 Orzo combined with a light lemon dressing and some fresh fruit pairs really well with garam masala chicken. This is an easy dish with great flavors. 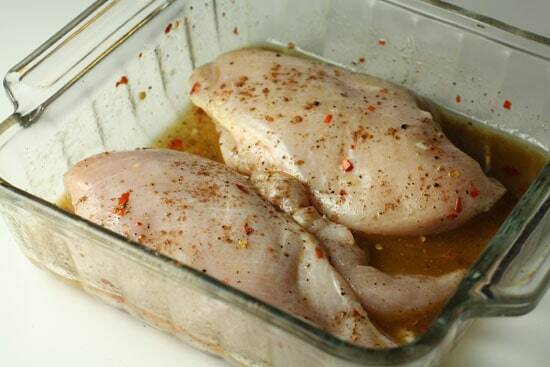 1) Mix marinade for chicken together and pour over chicken breasts. Allow to sit for a few minutes or you could marinade them in the fridge for an hour or two for best results. 2) Bake chicken breasts at 350 degrees for 20-25 minutes until cooked through. 3) Bring a pot of salted water (1 Tablespoon kosher salt per gallon) to boil. 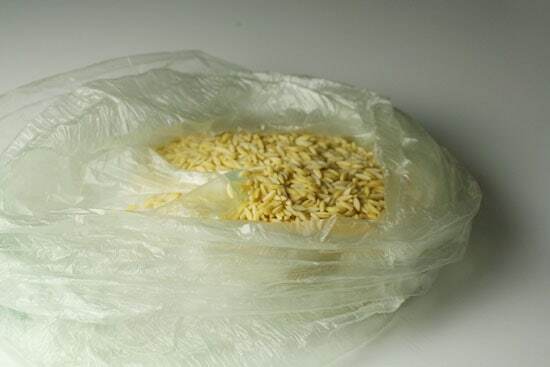 Add orzo pasta and cook until al dente, about 6-8 minutes. It should be tender but still have a bite. 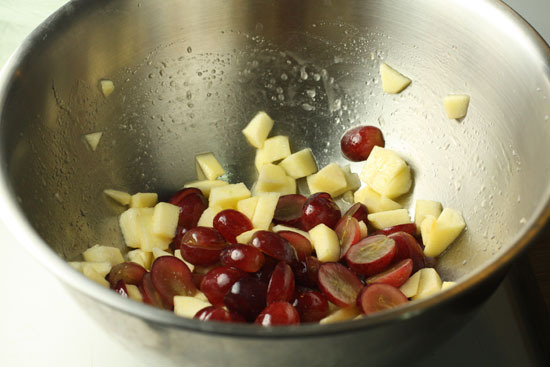 4) Peel and chop apple and halve the grapes. Mix with the lemon juice and olive oil. 5) When pasta is cooked, drain and add to the fruit. Add parsley, feta, and taste for salt and pepper. 6) When chicken is done, let rest for a few minutes and then slice. 7) Top salad with chicken and serve immediately. Salad is great cold the next day as well. When I cook boneless skinless chicken breasts, which is pretty rare honestly, I usually try to make a good and interesting marinade for them because honestly, as is, I find them completely bland. On this day, I opened my spice cupboard and this stuff was calling to me. 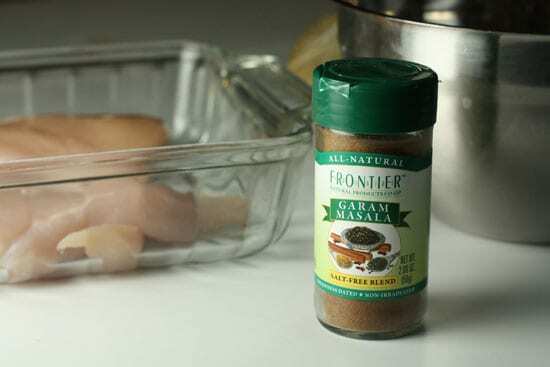 If you’ve never tried garam masala before, it’s a really awesome spice. Well, technically it’s a spice mixture and can have a pretty large array of stuff in it but it almost always will have some cinnamon, cardamon, and coriander. It has this really deep flavor that can add a savory and almost sweet flavor to a dish. I just whisked together all my marinade ingredients and poured it over some chicken breasts. I let them sit for the marinade for a few minutes and turned them once or twice to get the flavors all over. Ideally, you could marinate the chicken for an hour or two, but I didn’t have that kind of time. This is about as easy as chicken gets. Bake the chicken at 350 degrees (I baked them in the same dish) until it’s cooked all the way through. Depending on the size of your chicken breasts it’ll probably take 20-25 minutes. It couldn’t be easier. Meanwhile, we can work on the orzo pasta salad. Ok. I’ll admit that for a very long time I thought that orzo was a grain. I mean, after all, it looks like large grains of rice! Pasta trying to be a grain. But actually it’s a pasta as you might know. I don’t think most people cook with it that often and people probably mostly know it as being in those boxed rice pilaf situations. But of course it’s very good just to make by itself because then you can season it as you want and get away from those super-salty flavor packets that are usually in box mixes. I find orzo to be really awesome for dishes like this. Cooking orzo is just like cooking any other pasta. Bring a pot of salted water to boil (1 Tablespoon kosher salt per gallon of water) and when it’s boiling, add your pasta! Cook for about 6-8 minutes until the pasta is tender but still has a small bite to it. Then drain it and it’s ready to go! I decided to add some other stuff to the salad as well, mostly fruits, because I thought they would go well with the spices on the chicken. The lemon is most important. 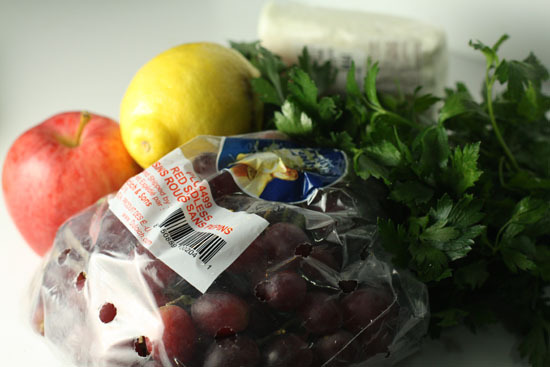 Peel up the apple and slice it into pieces, then halve the grapes, and toss everything in the lemon juice and olive oil. This will keep the apples from browning. Add the orzo, chopped parsley, crumbled feta, and taste for salt and pepper. The lemon really makes this salad and brings out all the fresh flavors. Add some feta and you’re ready to rock. When your chicken is done baking, let it rest for a few minutes and then slice it up! Serve it up on top of the salad and you should be all set. I like slicing the chicken not only because it looks nice but because Betsy and I rarely ever eat a whole chicken breast each so I find that 2-3 sliced chicken breasts can easily feed 4 people. Of course, if there are any leftovers, the salad is really awesome cold as well. The flavors get even better actually after chilling in the fridge for a day or so. Start to finish the dish took me about 45 minutes and most of it is just waiting for the chicken to cook. 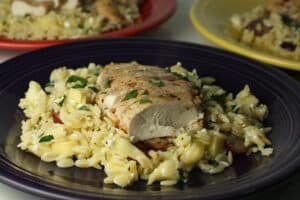 Very easy dish to make and it actually ends up being a kind of impressive dish because it has two things that most people don’t cook with regularly (garam masala and orzo pasta). In all honesty, this was one of my favorite pasta salads that I’ve made! I love the combination of spices in this dish Nick! I like the garam masala as well in the orzo. One of my favorite parts about making Garam Masala is using Amchuur powder – which is dried green mango. It gives a slight tangy kick to the powder. All in all, a very nice dish. I wonder though, what if you marinated the chicken first with some yogurt and that Garam Masala? Looks yummy! It might also be good with brown rice in place of the orzo – then you wouldn't even need a colander to drain the pasta! 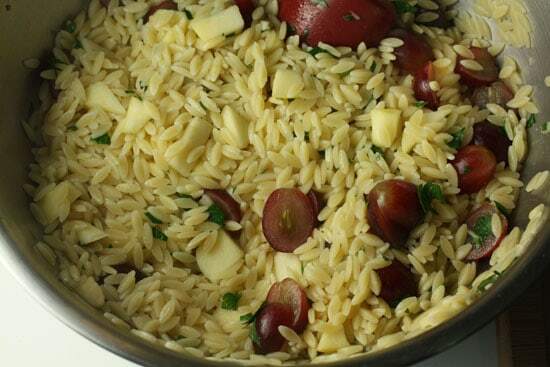 Love the idea of adding sweet (apples, grapes) and salty (feta) to orzo! PS I met your counterpart from foodiebattles in Boston: Dan. Made this twice now. First time for a friend going through chemo and she loved it…..not too spicy and she got the fruit fix she needed! Spiced it up a bit more for the second time and added some slivered almonds. I think any addition would work. « The Internet Kitchen: LAGGED! Recipes Home » Photos From Italia!